Photo and information used with the courtesy of Ann Mullen Boelter. 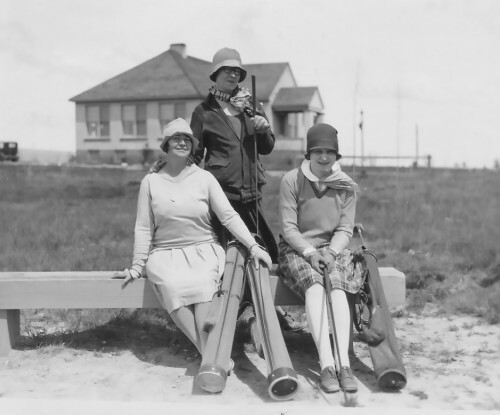 Miriam Moreland Corthell, on the left, with friends in the early days of the Laramie Country Club Golf Course. In the background is the country club clubhouse, pictured from the south facing north. The building now houses the Cavalryman Steakhouse. While there have been some additions made to the building over the years, the basic structure still remains the same. The building was constructed in 1925, designed by famous local architect Wilbur Hitchock to serve as the clubhouse for the local Laramie Country Club. It had a nine hole golf course built on sand as well as a swimming pool. The country club moved to the west side of town in the 1960’s and the building was abandoned for 10 years. In 1970, Bob and Betty Gerard founded the Cavalryman Supper Club in its present location. Just to the east of the building, remnants of the nine-hole golf course can still be found.